Want an easy way to teach your young children about the dangers of excess consumerism? Read to them! Shara Drew, the director of New Dream's Kids & Commercialism campaign, reviews two recent children’s books that deal with this topic in a way that's impactful and fun. She also suggests 8 more oldies but goodies. Josie & The Trouble With Trash is the third book in the Josie Goes Green series, ideal for 7-11 year-olds. 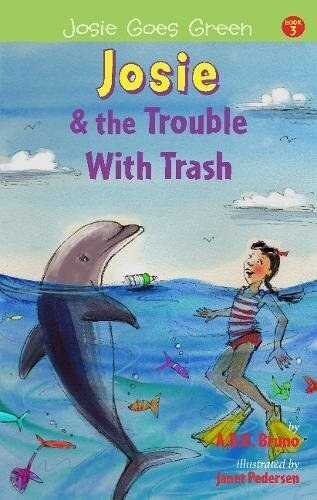 This book has righteous young Brooklynite Josie tackling the “War on Waste.” After Josie and her older brother discover plastic bottles washing up on beaches and harming marine life during a visit to their activist/scientist abuelita in Ecuador, Josie makes a promise to help end the pollution. Shocked to see that her school has installed a new vending machine and that teachers are being encouraged to buy bottled water to earn points in a contest to win tablets for the students, Josie organizes the Don’t Be Fooled Committee. Like the Fourth Grade Bike Brigade she founded previously to help reduce car emissions, Josie and her team of friends conduct careful research and smart activism. They petition the school’s teachers to stop buying the water to help them reach their goal of losing the competition so the machine will be removed. The Committee goes beyond its school walls, too, and the kids enlist business owners to help reduce plastic bag and bottle waste in their community. Josie’s older brother also gets in on the action in a surprising and bold Greenpeace-style act of resistance—for which he, Brooklyn, Ecuador, and the environment at large are rewarded. The book includes great educational bits (words in Spanish, facts about waste, etc.) and also covers themes like labor strikes and solidarity, as well as resisting excessive school testing/assessment. Fun and funky illustrations and smartly designed infographics come together to connect the dots between where stuff comes from, where it goes, and the effects on the planet and its creatures. The Big Picksure Book tells the offbeat story of Bojo Bandango, a rodent who climbs a giant pile a trash to find other animal friends variously affected by it. Asking questions every step of the way, Bojo and his heroic wild friends unite in an act of mass reuse/recycling to save the day. But the overarching theme of the story is deeper, encouraging kids—in its uniquely quirky style—to think critically about the connections between ourselves, our environment, and the things we use. The last half of the book is a series of infographics that presents consumption data related to the story in a kid-friendly visual format. While children as young as 4 or 5 may enjoy the fiction part of the story, the infographic section is most appropriate for more mature young readers. By moonlight in the quiet forest, a young boy and his family decorate their favorite tree with popcorn, apples, tangerines, and sunflower-seed balls as a gift for the animals of the woods. A quiltmaker helps a selfish king learn that giving is the true secret to happiness. The heartwarming, strongly moral tale supports important values, and the detailed illustrations, featuring dozens of lovingly rendered quilt patterns, offer hours of delight. Meet a crocodile, a snake, and an ant who would do anything for some kola nuts. Meet a demanding chief who seeks a worthy husband for his beautiful daughter. Now meet Koi, a worthy young man who just happens to have inherited a seemingly useless kola nut tree, and has just set out in search of adventure and romance. Could Koi's kola nut tree possibly bring good to others? And could this good possibly come back to him in full measure? Read this delightfully spirited tale by the premier re-teller of African folktales for children— illustrated with Joe Cepeda's boisterous paintings—to find out! The blanket that Joseph's grandfather made him is transformed into many things as the years go by: a jacket, a vest, a tie, a handkerchief—and finally a button. Gilman's modern adaptation and lively illustrations turn this favorite Jewish tale into a contemporary classic. Behold: the exciting adventures of The Dumpster Diver. Steve and his friends turn other men's junk into their own treasure through creative, if slightly perilous, means. These kids are so hip and trendy, they probably don't even know it—their posse's actions are a great starting point for discussions with your children about recycling, art, invention, and doing good deeds. Molly Lou Melon's grandma taught her to be happy with herself no matter what, but that's not all she learned. Molly Lou heard all about how her grandma didn't have fancy store-bought toys when she was little. She made dolls out of twigs and flowers and created her own fun in her backyard. So Molly Lou does just that, proving that the best thing to play with is a huge imagination! Enter the witty, intriguing world of Weslandia! Now that school is over, Wesley needs a summer project. He’s learned that each civilization needs a staple food crop, so he decides to sow a garden and start his own—civilization, that is! He turns over a plot of earth, and plants begin to grow. They soon tower above him and bear a curious-looking fruit. As Wesley experiments, he finds that the plant will provide food, clothing, shelter, and even recreation. It isn’t long before his neighbors and classmates develop more than an idle curiosity about Wesley—and exactly how he is spending his summer vacation. When a young girl moves to the city and brings a suitcase full of seeds with her, the garden she creates both delights and transforms a neighborhood! The book is a great way to inspire children to grow their first plants.